St. Catharines residents Kennedy Wilson and Bryan Gent never thought they would welcome the first baby born in 2018 at Niagara Health’s Women’s and Babies’ Unit. Kennedy was due on Jan. 24. 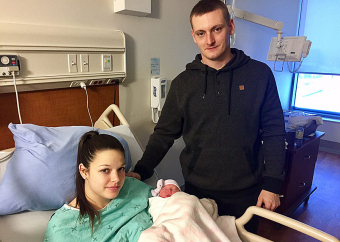 But little Kinsley clearly had other plans: She was born at 12:51 a.m. on Jan. 1, weighing seven pounds, six ounces. “We never expected it to be from us,” Bryan says of welcoming the first baby of the New Year. “Especially because the due date was further ahead,” adds Kennedy. It was also special for Registered Practical Nurse Ariane Sneek who was part of their healthcare team. It’s the first time Ariane was involved with a New Year’s baby birth. “It was pretty exciting,” she says.